Ajith's Vivegam is a blockbuster, but has the 'ultimate star' overshadowed the actor? The year was 2007, the place — Chennai's Inox theatre, where a first day first show screening of Billa, starring Ajith Kumar, was in progress. The hall was full, the audience's excitement palpable. There to review the film, here was my chance to assess — to some extent — what made Ajith tick. Seated next to me were two girls — friends who seemed to be of college-going age. The minute Ajith appeared on screen, they jumped out of their seats, screaming, going wild. The same was true of pretty much everyone else in th auditorium as well. I'd known of Ajith’s reputation as a heartthrob, but the scene at the theatre that day was unforgettable and a bit shocking. Ajith’s dedication and screen presence had already made him one of the top actors in Tamil. With stylish filmmaking, great art direction, awesome costumes and superb stunts, Billa was a great tribute to the actor. Vikram is known for his commitment to his roles: he won't hesitate to shave his head or transform into a hunchback. Losing or gaining a few kilos is regular business. For him, acting is not just a display of skills appropriate to the scene but a master class on how the scene ought to be done, imparted to all and sundry. Suriya approaches acting with a persistent sensibility; ploughing at it, hoping to achieve the pinnacle on the basis of his slogging. He seems to be an actor who has restrained his intelligence in interpreting a shot in service of how a director dictates it should be done. When it comes to Dhanush, I have come to believe that his single standout quality is mockery — at the woman in his movies and if they are not there (which is quite often), at the surroundings. When he dances, it is to an inner rhythm devoid of technique or skill. Dhanush always seems to be Dhanush and these days, when that may not be enough, he is Rajinikanth. How did Ajith beat them all? It really can’t have been the cakewalk he makes it out to be — or was it? Without any godfather or director-father, the journey can’t have been easy. Why do fans see actor Vijay as the only rival to the crown that they want for Ajith alone? Why do people on social media devour anything to do with Ajith or Vijay? Why do YouTube videos featuring the actor get millions of hits? Why is every Ajith movie release akin to a festival? Can we now assume that the prince has, at long last, been crowned? Everybody who has seen Ajith’s latest, Vivegam, knows that this is the actor’s 25th year in cinema, a career that began with Amaravathi in 1993. An explosive action thriller, Vivegam had a great opening at box office and on 17 September, marked its 25th successful day in the theatres. Shot extensively in Europe, Vivegam features Ajith as a highly trained spy fighting a conspiracy. During the interval (I was watching the film in a rather rundown theatre in Ooty), a stranger came up to me and said that no one enjoys the 'image' Ajith does in Tamil cinema. “You have to watch the second half. It is unbelievable. It is Ajith alone that makes the role plausible,” he said. That was only the third show of the first day and it was clear that this man had already paid homage to his movie god. That goes to show Thala’s (leader’s) unrelenting grip at the box office. When Ajith started out as an actor, I thought he was a chocolate boy, a 'flavour of the season'. I could be forgiven for thinking that — although Amaravathi was a success, no one then could have predicted the mass hysteria that Ajith provokes today. Certainly, no one could have foreseen the one-man industry the action icon has become. Until Aasai, his seventh film, not many had even heard of Ajith. He had not yet become a force to reckon with. What makes his ascendancy even more astonishing was that he had been written off several several times in his injury-riddled career. I recently watched an old interview of Ajith's, on YouTube. )Interviews with the actor are rare — the media courts him assiduously; he doesn't reciprocate.) Ajith looked smart, his hair cut a little closer than what we're used to seeing onscreen. He spoke impeccable English; he was refined, polite, and (as it seemed to me) honest. He didn't uite bother with formal niceties. When the interviewer asked probing questions, Ajith got combative. His answers were sharp, accurate, concise. In an industry given to a certain level of phoniness, Ajith’s attitude was refreshingly appealing. In Aasai, Ajith played a man who hasn't yet come to terms with his good looks, shy and reserved. When he talks, he chooses his words carefully. His decency is his currency, making him an unlikely obstacle to the psychopath played by Prakash Raj. A few years later, Ajith did a volte face in Vaali, in a double role that had him playing brothers as different as chalk and cheese. The younger brother is forward and dashing in an almost irresponsible, devil-may-care fashion, romancing Simran with an easy charm. The older brother's character has shades of Prakash Raj’s role in Aasai. This is but a small measure of how much Ajith gambled with his career at one point, not in the least frightened to push the limits of what the audience could expect from him. Vaali, though quintessentially commercial, had a story featuring Ajith and not one written especially for him. The failure of the years preceding Vaali had taught Ajith a valuable lesson, one which Kamal Haasan had learned before he produced and starred in Apoorva Sagodharargal. At this point in his career, Ajith can probably work with the directors he chooses. The screenplay is now tailor-made for the actor, catering/pandering to and boosting his image among the movie-going masses. The actor’s success over the last few years has been, perhaps, unparalleled. And the movies are getting more and more outlandish. Like many others before him, Ajith seems to be choosing movies for their box office potential rather than critical quality. When he is so willingly walking into a image trap, you feel for the actor. The instant success of today’s movies may not have enduring appeal. Is the actor aware of this pitfall? His name may already be etched in the chronicles of box office history in Tamil cinema, but how will he stand tall forever in the annals of popular cinema? Even as he rakes in the riches at the boxoffice, his innate charm and untouched mystique is being spent. Are we then, these days, drawn to the flickering, seductive image of the actor’s success rather than what we genuinely admired and originally liked in Ajith? Has the 'Ultimate Star' overshadowed the actor? 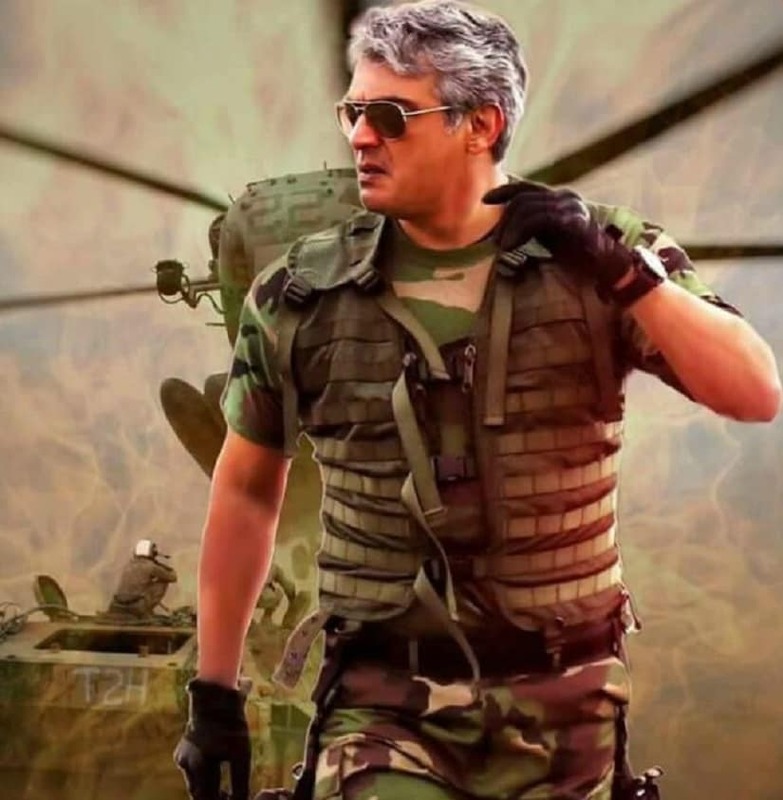 1Ajith's Vivegam is a blockbuster, but has the 'ultimate star' overshadowed the actor?